Fabchannel made its share of mistakes. They scaled too early and they let their costs get too far ahead of their revenue. Many years in the venture capital industry taught me that being too early can be as fatal as being too late. On the other hand, their vision for the industry is absolutely spot on. Live music is the future. As I noted in an earlier blog discussing Shepard Fairey, there is a complex relationship between using your art to promote your art and using your art to make a living. The modern audience is too technically sophisticated and nuanced to be reached by the ham-fisted approach of "charge for everything" and "pay for everything". There is an old saying, "If the only tool you have is a hammer then everything looks like a nail." Unfortunately it appears that (most of) the recording industry has only a hammer when the times demand a more sophisticated tool kit. Music - writ large - is going to survive the death of the traditional recording industry. Music will re-emerge in a format that embraces internet technology. It will rise from it ashes of the 20th century model. Music is too much a core part of the human spirit to die. Unfortunately there is no guarantee that classical music will make this journey. We are fragile. We cannot afford to be followers. The loss of the promotional power of the recording industry could be fatal. There is a very real danger that the audience will vanish before a new promotional engine is created. Classical music could become a museum exhibit instead of a lively and thriving art form. Let us all hope that we can collectively seize the initiative before it is too late. Are you an executive with a classical music Arts Organization? Are you suffering from a decline in your audience? Are you struggling to determine how to keep your donations at the level necessary to sustain your quality and presence? Are the old mechanisms for audience development and fund raising failing you? Perhaps you should "get with the times"! Barack Obama was a black man who's middle name was Hussein. He was a one term senator with much less that 10% name recognition. He was competing against Hillary Clinton who had over 95% name recognition, a list of major donors a mile long, the support of the entire democratic establishment and was a prohibitive favorite to win the democratic nomination. Against those odds, in a period of 18 months, Obama raised more money than any candidate in history, won the nomination and became the 44th President of the United States. How did he do it? "Barack Obama's victory was due to an extraordinary internet presence and a solid policy for engaging his potential constituents." "What was truly historic in a different way was that this was the first time a digital community was a prime mover in a successful election. In the Barack Obama campaign the internet housed a community that helped drive his victory. The tools - the social media like blogs, texting, podcasts... outreach programs aimed at external communities and social networks...led to the record millions in donations and the enormous volunteer armies that did the sweat work day in and day out to make Barack Obama POTUS." (President of the United States). In these days of economic crisis it is critical that Arts Organizations engage their constituents in the same way that the Obama campaign engaged their voters. The audience must be promoted from their historic roles as listeners and attendees to their new role as classical music missionaries. They must be made to understand the crises faced by the classical music that they love. They must be recruited to become part of the campaign to save that music and the arts organizations that make it possible. You - their local Arts Organization - must motivate them to engage in audience development by reaching out to and recruiting the "fans who don't know they are fans". You must also motivate them to donate the small sums they can afford and to solicit their friends and colleagues to do the same. Only the internet can make such solicitations cost effective. You will be astonished by how fast these donations can add up. The social networking tools needed to drive this kind of program are well understood. They are, however, useless unless they are marshaled by a dedicated, focused, sustained and inspirational program. To accomplish such a program, Arts Organizations need to staff a full-time position which is exclusively focused on building these sustained internet campaigns. This position should be staffed by someone under the age of 30 - someone who has lived the new media experience and understands it down to their very core. I have often heard that organizations cannot afford such a position. Baloney! 21st Century Arts Organizations will not survive without a focused new-media program and the dedicated leadership to drive it! I will be sharing success stories and promoting a dialog on how to really make this work in future posts. Good luck to you all. Shepard Fairey has recently become front page news as a result of his Obama “Hope” poster. Fairey started as a street artist who regularly got arrested while painting his work on buildings and in other public places. Before the internet he would Xerox his work and hand it out on the streets and at events. He would encourage the recipients to copy it again and distribute it further. After the internet he became a master at viral distribution of his work. In the process he has managed to keep a counter culture image while becoming the image designer for such commercial icons as Saks. There is much that can be learned from this and applied to classical music. 95% of music downloads are illegal!! The largest remaining CD store in America is closing. Virgin MegaStore in Times Square. Looks like a good CD buying opportunity. This was one of the last retail outlets in the US with a reasonable classical selection. Get em while they're hot! Driving into work today I heard an interview on Fresh Air with Steve Knopper, a reporter with Rolling Stone and author of the recent book Appetite for Self Destruction - The Spectacular Crash of the Record Industry in the Digital Age. I only forecast that the Labels will drop classical. He predicts their imminent demise!! I can't wait to see his hate mail :-). The interview is well worth the time to listen. The classical artist and fan will find many useful observations. How does an artist make money? Perform! What is the role of recording? To promote performances! How did Bruce Springsteen promote his upcoming tour? He released free music for download on the Internet! How has the model changed? Touring was used to promote the sale of recordings. Now recordings are used to promote the tours. I will post a link here to the audio after it goes on-line. As you can see the download revenue has come no where near to replacing the lost revenue from physical sales. 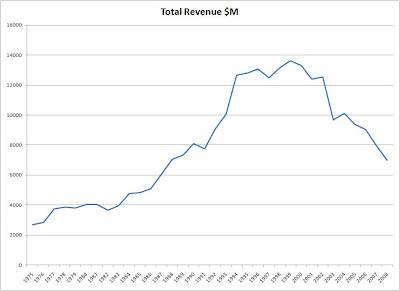 Total revenue has dropped by more than $6B or nearly 50%. Downloads do not represent the economic salvation of the industry!